Sclerotinia sclerotiorum is a hemi-biotrophic fungal plant pathogen, therefore a biotrophic and necrotrophic pathogenic lifestyle is followed. This fungus has an extensive host range of more than 500 plant species, including sunflower, soybean and canola. These crops play an important role in the South African economy as oil seed crops. However, some vegetables may serve as alternative hosts which include (but are not limited to) cabbage, potatoes, squash, carrots and tomatoes. Many common South African weeds are also susceptible to infection by this pathogen and are associated with these crop production systems. As a result of the many host plants associated with this pathogen there are more than 60 common names associated with S. sclerotiorum infections. The most common are Sclerotinia head rot, Sclerotinia stem rot, white (may in some cases be cream in colour) mould and cottony soft rot. These common names are associated with the distinct symptoms and signs associated with Sclerotinia infections. The symptoms associated with a disease are the host's response in a conducive environment, whereas the signs are a physical reaction of the pathogen. These signs may also be seen morphologically in the laboratory. In the case of Sclerotinia diseases, mycelium (mass of fungal hyphae) and sclerotia (Photo 1) are the primary signs of the pathogen’s presence. Sclerotia, melanised masses of hyphae, are key to the life cycle of this fungus as they are the survival structure produced. The visible symptoms are dependent on the host growth stage. Seedling wilting may occur, although Sclerotinia stem and head rot frequently develop at flowering and pod or seed filling stages. 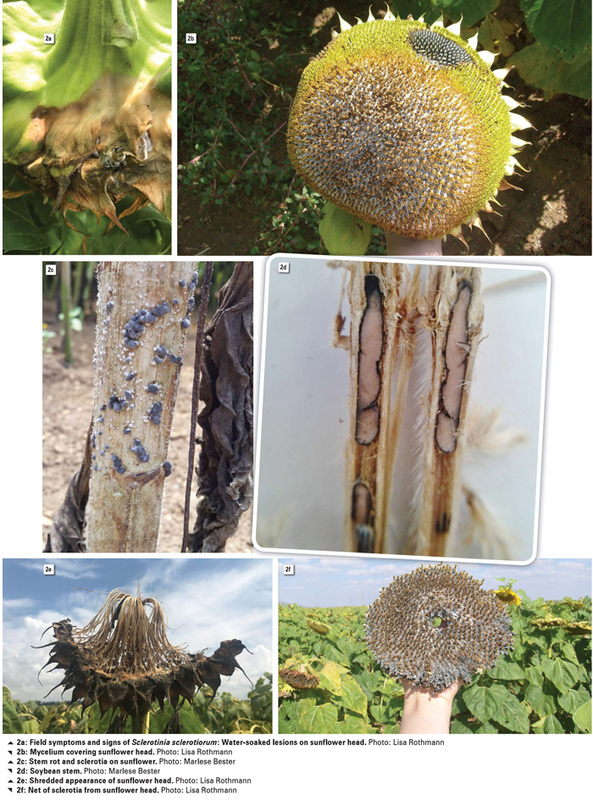 Brown water-soaked lesions (Photo 2a) are initial symptoms observed that become covered with white cotton-like mycelium on sunflower heads (Photo 2b) and soybean pods as well as in and on the stems of both sunflower and soybean (Photo 2c and Photo 2d). The white mycelium on the face of sunflowers eventually develops into a net of black sclerotia (Photo 2e). As the disease matures, a shredded appearance, with sclerotia between plant fibres can be observed in sunflower specifically (Photo 2f). This fungus can also infect the subterranean crown and form sclerotia within the lower stem of sunflower and soybean. The initiation of the infection cycle of Sclerotinia diseases is dependent on the interaction between the sclerotia present, i.e. primary inoculum source, the presence of the host and an environment conducive to disease development. Sclerotia are highly resistant to dry heat of up to 70˚C and prolonged periods of freezing. Sclerotia can stay viable in the soil for up to eight years, although this is dependent on the strain and locality, as well as soil characteristics. Sclerotia found in the first 5 cm of soil are considered important for disease initiation. Infection by S. sclerotiorum can occur through two means of germination to produce primary inoculum, namely myceliogenic and carpogenic germination. Each method of germination is dependent on the environmental conditions present. Myceliogenic germination occurs when sclerotia produce hyphae under temperatures ranging from 20˚C to 25˚C in the presence of high relative humidity. The latter is assumed to be greater than 80% in literature. Carpogenic germination results in the formation of apothecia Photo 3a, or mushroom-like structures. This occurs at lower soil temperatures ranging between 16˚C and 20˚C at a higher relative humidity as for myceliogenic germination. Apothecia are commonly misidentified as the common bird’s nest fungus Photo 3b. Apothecia release ascospores into the air under high relative humidity and changes in air pressure, favouring long distance dispersal and infection. Literature states the movement of ascospores can be within-fields and between fields. However, it is accepted that most ascospores are dispersed within 150 cm of their apothecial source. 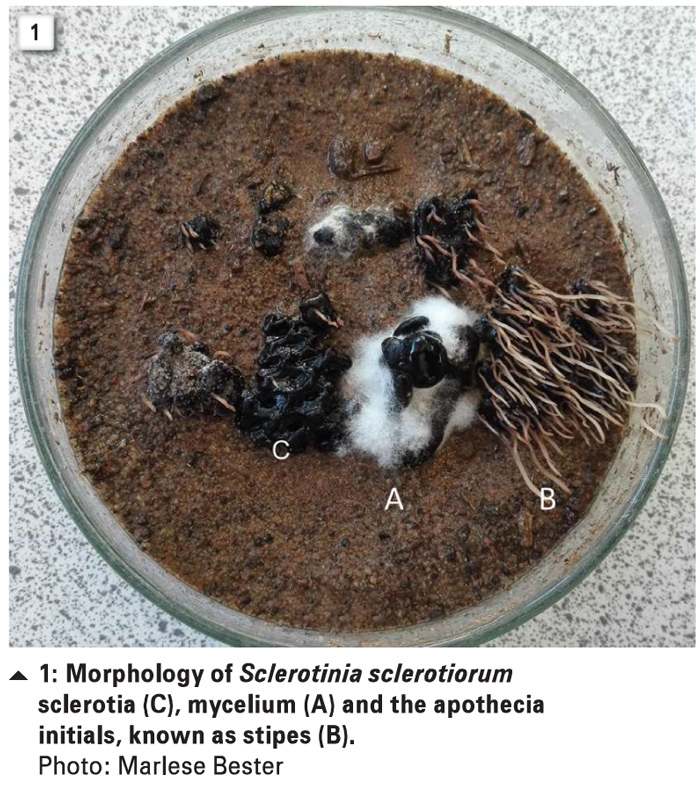 Furthermore, S. sclerotiorum has the ability to remain dormant in the form of mycelium in infected plant residues when environmental conditions are unfavourable for germination and infection. From the above it is clear that S. sclerotiorum is highly dependent on its environment – both weather and agronomic conditions – for disease initiation, development and survival. Cool and wet conditions favour disease development. A daily plant surface moisture of 12 hours to 16 hours or a continuous plant surface moisture of 42 hours to 72 hours together with temperatures ranging from 10˚C to 25˚C are required for disease development. The disease is more prevalent in fields were crops have a dense canopy and air circulation is limited, as a result creating a favourable micro-climate for disease development. This is directly related to the population density and row spacing selected at planting, as well as the selection of cultivars prior to planting, as cultivars vary in their physiological structure, i.e. determinate or indeterminate. Thus, increasing inter and intra-row spacing or reducing plant populations per hectare will increase air circulation which can reduce the risk of Sclerotinia infection. This pathogen has a complex life cycle and interaction with its hosts and environment, which makes the management of this disease intricate. One of the first steps to managing the disease is to purchase disease free certified seed. The South African National Seed Organisation (SANSOR) uses methodologies prescribed by the International Seed Testing Association (ISTA) for evaluating registered seed. The current limitation from ISTA of sclerotia in soybean seed is 0,2% in a 1 000 g sample. This is required prior to the issuing of a final seed lot certificate. The virulence of the sclerotia is not tested during this period. However, legislation states no more than 4% sclerotia may be present in canola, soybean and sunflower seed. Therefore, the SANSOR regulations are much stricter, only allowing 20 g of sclerotia per 10 kg, in contrast with the 400 g of sclerotia per 10 kg. Seed treatments have been said to reduce the germination of the sclerotia present. Preliminary tests at the University of the Free State (UFS) of sclerotia, found in treated sunflower seed, have indicated that sclerotia may still germinate, although this requires further elucidation. Weeds are also known as alternative hosts and thus it is crucial to reduce the quantity of weeds present within and surrounding host crop fields. This will reduce the build-up of the fungus, either in the form of mycelium or sclerotia, in the immediate vicinity of the host crop. Crop rotations with non-host crops can reduce Sclerotinia inoculum levels. However, the survival time of sclerotia in soil as well as the extensive host range of the pathogen should be kept in mind. There are contradictory reports on the effectiveness of tillage practices on controlling Sclerotinia diseases, due to the relationship with sclerotial survival. Reduced tillage promotes surface sclerotia, and reduces the production of apothecia, while deep tillage can promote re-emergence of sub-soil inoculum and sclerotia to the upper 5 cm of the soil surface, which is the pathogen’s active zone. Burning crop residues is a common practice to reduce pest populations. There is limited information available on the effectiveness of burning on sclerotia or mycelium survival and viability on stubble. Reports state that the amount of stubble, sclerotial size as well as temperature and duration of the fire can result in variable results of the sclerotia germination, and ultimately yields burning as an ineffective method of control. Currently, in a worldwide context, there are no commercially available resistant sunflower or soybean cultivars. However, the manner in which soybean and sunflower cultivars differ in their response to the pathogen under disease-favourable conditions differs and selection of more ‘tolerant’ cultivars can reduce the risk of infection, yield losses and inoculum buildup in fields. The response of soybean and sunflower cultivars to disease potential can be quantified using regression analysis. This analysis can determine the type of response as well as the relationship observed between Sclerotinia stem and head rot within a cultivar to changing disease potentials. Disease potential is defined as the mean disease severity over all cultivars of the respective crop under specific environmental conditions. Cultivar tolerance to increasing disease potential. Cultivar intolerance to increasing disease potential. Cultivars having a linear relationship with increasing disease potential. This regression methodology can be an effective and accurate tool to quantify the response of cultivars to different disease potentials and subsequently help the selection process of cultivars for a specific disease potential. Biological control of Sclerotinia diseases can be achieved through two pathways, i.e. directly through the use of actively growing micro-organisms to target and parasitise the pathogen, or indirectly through secondary metabolites produced to supress pathogen growth, promote plant health and induce resistance mechanisms. The former focuses on the use of the fungus Coniothyrium minitans, which reduces sclerotial survival through degrading the sclerotia in fields previously infested with S. sclerotiorum. The latter includes fungal and bacterial organisms such as Trichoderma spp. and Bacillus spp. There are multiple biological control products available in South Africa. However, the efficacy of many of these within our South African context needs to be confirmed. There are limited registered fungicides in South Africa. Currently, benomyl and procymidone are used on peas and sunflower. Furthermore, the exorbitant cost of the chemicals and their application as well as the potential requirement for multiple sprays are economic risks for producers. Forecasting the risk of Sclerotinia diseases, based on agronomic and weather variables, could benefit producers by identifying intervention thresholds and optimising the timing of management strategies. These risk assessments have been successful internationally for canola and soybean. The systems range from simple check lists to more advanced mathematical modelling, which is ultimately visualised as a risk percentage or proportion, followed by a recommendation to apply (as well as application timing) or withhold fungicide applications. The change in agronomic decisions, environmental and weather conditions, management practices and the susceptibility of germplasm has led to an increase in the importance of Sclerotinia diseases worldwide. The greater the prevalence and severity of the disease, the lower the yield and the greater the inoculum build up. In the 2017/2018 season, sunflower and soybean epidemics causing up to 80% yield losses were reported in the Eastern Free State. During 2014, in South Africa, the effects of Sclerotinia stem rot of canola gained more attention due to the greater prevalence of the disease during the season compared to previous years. Although extensive literature is available with regards to Sclerotinia diseases, this disease remains problematic in economically important crops, and the pathogen’s behaviour locally needs to be clarified. This investigation is a priority of the South African National Sclerotinia Research Network. The spread of S. sclerotiorum into critical South African crop production areas and its associated yield losses, highlight the importance of identifying and deploying effective management measures to safeguard agricultural land against the initial incursion of this pathogen. For more information please contact Lisa Rothmann at coetzeeLA@ufs.ac.za and follow the South African Sclerotinia Research Network on Facebook, Instagram and Twitter.